Each of us has our own road, our own path, to follow, and yet we so often allow our selves to be guided by the expectations of others. In order to find true happiness we must learn to listen to our own intuition, to the inner voice that speaks to us. That voice is what tells us what is best for our own lives. Just as we can't live the lives of others, neither can they live our lives. Allow yourself time to just sit in quiet and listen to your inner voice. What is it telling you? As I meditate each morning in quiet I allow my inner peace to come out, and as I feel the peace I listen to my own voice. I am often surprised at what it tells me, because I know that I have spent too much of my life following the expectations of others. So if I find myself following a path that doesn't feel right for me, I stop and change my direction. You can too. 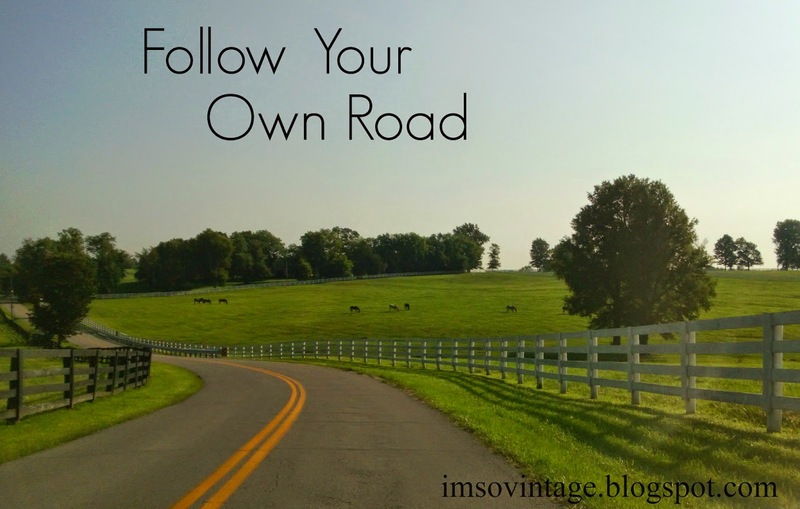 Just listen to your inner voice and take your own road. It will lead you to some surprising and exciting places. This is such an important message Laura. I believe that each of us has a special gift, a special calling. Too often we say "I can't" instead of "I can". Being guided by the intentions of others never allows that special something that lives within each of us to shine. Thank you for giving us the nudge we all need to hear. BTW, you live in idyllic country! So pretty. Your first paragraph rang so true. I have been trying to make a decision on something and finally decided to do just what I wanted to do and not care what others thought. Wise words......been there and done that myself. Haven't we all at one time or another? That still quiet voice will never lead us wrong. I was just talking this over with a friend. She asked me the question, "What keeps you from pursuing what you feel called to do?" I thought about that. There are several reasons. 1. I don't feel like I know enough and no formal education to launch my dreams from 2. I am afraid of not having the approval of others or that they will look at me and go, "Who does she think she is?". 3. I don't want to be under the "thumb" of an organization. REally it all boils down to fear. Fear is crippling. Fear or faith? So many thoughts here that you expressed that are mine. Now is the time to let go of the opinions of others and do what we feel in our hearts that it is time to do. This is a great post Laura. I have been listening to my inner feelings of late and I think while we have a hard time doing this it is a great thing when you do stop to listen. I think it is so hard for us girls to do this with always being care takers, the best mom, grandma's, wives, lovers etc. that we lose track of our own need and wants. So freeing when you do listen to your inner feelings. Thanks for this post. It touched me today. I think it's very difficult sometimes to follow you own road when it's not the same one as others or not the one people want you to follow... So it's nice to have someone reminding you to do so every now and then.